The above pic is something I submitted to the website Superman-With-Chimps for their September gallery. If you like drawing comic characters ( especially DC ) then you should take a look at the site, they have a monthly contest, and some great Superman related prizes. 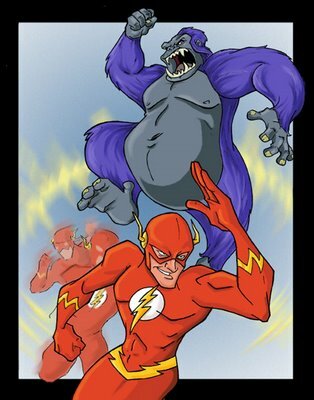 So the pic above is of "The Flash" against his enemy "Gorilla Grodd"..I wanted to do something more with it, but I eventually just hit a stopping/bored point with it and was all "Meh..It's good enough." I liked the composition, I think it's just the background and all. Hopefully I'll start keeping up with my posts a bit more often..Take It Easy!